I mentioned in my last post that I’d been knitting. And if you did, you’d only be mirroring the comments made by my loving, yet not always understanding husband. You see he thinks that knitting is a colossal waste of time. I have to keep reminding him that keeping fish is not my idea of a party, either. And we do all have our hobbies. But honestly, I find that clicking the old sticks is immensely relaxing…at least most of the time. I have, though, been heard to chant "Damn, damn, damn!" if I drop a stitch and need to retrieve it. But I’m nothing compared to these women. Personally, I think I make kind of cool stuff. 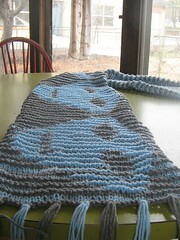 Like my latest: The Alien Illusion Scarf. 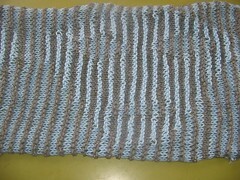 It’s knit so that the pattern can only be seen from certain angles. I’ve found a group of illusion knitters through Yahoo and am know learning how to graph my own designs for IK. I was thinking about a dishcloth with a resistance fist on it. I think I’d find that satisfying on so many levels. Meanwhile I am making Chris a cool camouflage earflap cap. Being the baja bug (sans sunroof) driver that he is, I think it’ll get a lot of use. I went online last night to find a pattern. I think I’ll use this one, only without the pom pom, and in desert colors. Then I can finally get around to what I want. And with my somewhat taciturn disposition, I think I’ll produce this lovely. Dontcha think it’s perfect for me? That alien scarf is way cool. I like the idea of the resistance fist washcloth, too. I have been knitting a scarf since September. It isn’t cool like that one. Just to get the feel for knitting. I just haven’t done the knitting thing for a while. I do kind of think of it as an old lady activity though. LOL. But, I enjoy it. You should try some of the fun designs floating around the internet. I can hardly decide what to knit next.